When it comes to finances, credit scores are some of the most important numbers you have. Good credit scores will help you get the best terms on your mortgage and auto loan, as well as competitive interest rates on new lines of credit. Low scores have the opposite effects – you will need to pay more to use credit and face higher interest rates on your home and car. Really bad credit scores can prevent you from getting loan approvals, renting apartments, and even securing a job in some career fields. If your credit card debt is out of control, there is a strong possibility that your credit score is suffering. Late and missed payments, and reaching credit limits or carrying large balances, will all impact your score. If you’re concerned about what debt is doing to your credit score, call Consolidated Credit today. Our trained credit counsellors can help you get back on track, and the advice is always free. 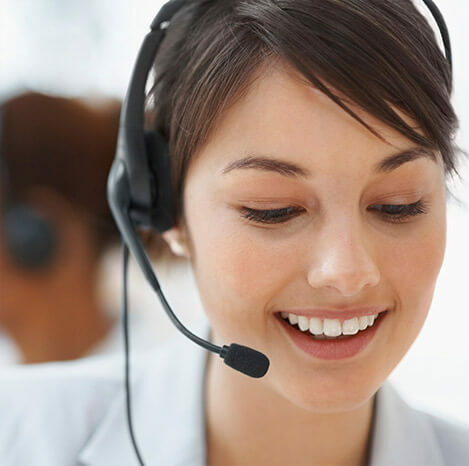 Call us at 1-888-294-3130 or get started online with our Free Debt Analysis and a counsellor will reach out to you soon. Is a credit score the same as a credit report? 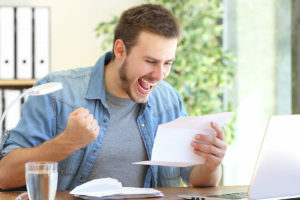 Your credit score is a numeric evaluation of your credit worthiness – the higher the score, the more lenders will trust you to pay back your loans. It is a three-digit number between 300 and 900. 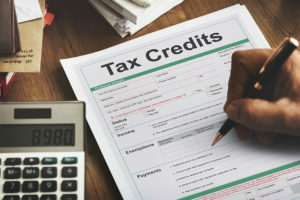 Your credit report is different; it’s a lengthier overview that covers the history of your credit use, as well as any other information that might be pertinent to creditors. Your credit scores from the main credit bureaus (Equifax and TransUnion) are both calculated using a variation of the FICO score calculation. 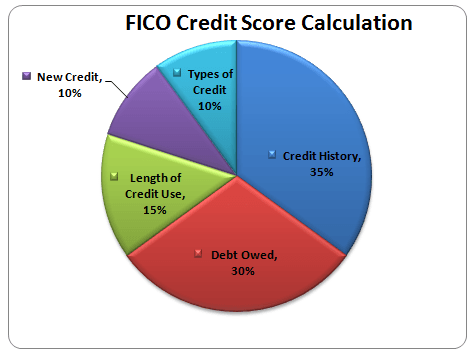 The FICO score (a standardized calculation developed by Fair, Isaac & Company) is based on five different factors. Each factor has a different “weight” in terms of its importance in your credit score. Understanding which factors are most important will help you prioritize your efforts when trying to maintain a strong credit score. It’s also a good place to start if you need to rebuild your credit score. Credit History (35%) – This factor refers to your history of debt repayment. Your credit history shows creditors how responsible you’ve been at repaying your debts in the past. A consumer who consistently pays late or misses payments is a high-risk borrower, and thus has a lower score. Debt Owed (30%) – This factor focuses on the total amount of debt you owe overall in relation to what you have available. If you have a large amount of debt, creditors consider you as a higher-risk borrower because you already have a heavy obligation and aren’t as likely to be able to handle new credit. Creditors are wary of lending to consumers who already have a high debt-to-income radio. Length of Credit Use (15%) – This refers to the total amount of time you’ve used credit of some kind. 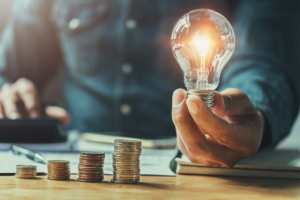 Creditors consider a borrower with a long history of credit use to be a lower-risk borrower, because that user is accustomed to dealing with credit. Newer credit users have not yet established themselves in the eyes of lenders. New Credit (10%) – This factor focuses on the number of new lines of credit you’ve opened recently or applied for. Taking on a lot of new debt in a short period of time makes you high-risk. Each time you apply for new credit, an inquiry is made on your credit report. Too many inquiries within the past six months to one year can have a negative impact on your credit score. Types of Credit (10%) – The final factor focuses on the types of credit a consumer uses. Creditors will look to see that you can handle different types of credit; revolving credit, like a credit card, or installment credit like a personal loan with fixed payments. Having a healthy balance of different types of credit will create a positive impact in this area. Knowing the ins-and-outs of your credit score can help make sure that you maintain a strong credit profile, resulting in better interest rates and a smoother financial lifestyle. Knowing the make-up of your credit score will also help you decide if you need to fix your credit score and what path to take. You should always check your credit scores at least six months prior to applying for a new loan. 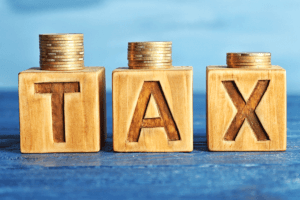 This will help ensure your credit scores are where you expect them to be, so you won’t be caught off-guard by higher-than-expected interest rates or stricter terms. If you find that your credit scores are low, take steps to repair your credit score now. If you need help reducing debt so you can get your credit back on track, give us a call at 1-888-294-3130 to speak with a trained credit counsellor about your finances. You can also get started online with a Free Debt Analysis and a counsellor will be in touch.